Here at E Rider, we stock a range of electric mopeds and scooters. Electric vehicles such as this haven’t just become something we sell, but our passion. So much so that we’ve not only gained an immense amount of knowledge and expertise around the vehicles we sell, but we have learnt an incredible amount regarding their history too. For those who might want to learn a little about their vehicles, where they came from and how they became so popular, here’s a rundown of the electric scooter; the early years. If there’s one thing you need to know about the electric scooter, it’s that you’ll probably be riding one soon. Electric vehicles are taking the world by storm as we all now strive to reduce our carbon footprint. Particularly in places like London, where emission zones and congestion charges apply, electric vehicles are fast becoming the more popular choice. Not only do many find themselves exempt, but they also realise the beauty of riding a vehicle with zero carbon emissions in such a heavily polluted area. Though it may come as a surprise, the positivity surrounding electric mopeds and other electric vehicles wasn’t always there. The actual concept of the electric scooter/moped was first patented around 1895. That’s a whopping 124 years ago. They were slightly different from the very efficient vehicles we use now, capable of speeds such as 50mph. The exact stories of the electric mopeds origin are always a little hazy. What we do know however, was that the first patent in 1895 was by an American man called Ogden Bolton Jr. He was an inventor and was, by the looks of it, way ahead of his time. His patent actually proposed a design with an electric motor located on the hub of the back wheels. Not only did the electric motor use a six pole direct current but it also included a 10 volt battery. Despite this rather in-depth patent, there’s no evidence of whether it was actually made or produced. In the early 1900’s however, a company named Ajax Motor actually produced an electric scooter. The company were based in New York but despite the production of the vehicle, it never actually moved on the road for the general consumer market. It wasn’t until 1919 that progress was actually seen when the Ransomes, Sims and Jefferies made and created a public prototype of the electric scooter. The first ever electric bike was known as the Electrocyclette and was considered somewhat of a trike as opposed to a scooter with a single wheel at the back and two wheels at the front. Unfortunately, even with a great amount of backing, these still didn’t get themselves on the road leaving the good old electric scooter to make its big impression another day. During WWII, the world faced an almighty fuel shortage of both gas and oil. Fuel usage was incredibly high but the vast majority of the fuel available went toward the war effort. This meant many going in search of alternative fuel sources. It was at this time that a fuel operated scooter was converted to electric thanks to the inventor Earle Williams who created a design called the Par-Car. It wasn’t until a company named Marketeer got involved that it was actually produced and manufactured. Marketeers weren’t the only one to produce electric vehicles however as a Socovel, founded by the Limelette Brothers created around 400 vehicles which ran on batteries in 1936. These were actually sold to the public. Throughout the 60’s and 70’s, the electric moped evolved hugely with advancements centred around the actual battery itself. It was also during this period that people began seeing a large amount of electric automobiles on the roads legally. In 1967 however, history was made as a Karl Kordesch successfully created a hybrid electric/fuel scooter which offered a top speed of 25mph and a range of 200 mpg. In 1974 however, the first hybrid faced stiff competition as manufacturers Auranthic Corp released a scooter called the Charger which although, only possessed a range of 50mpg, it offered speeds of 30mph. Fast forward to today however, and it’s there for all to see just how far these vehicles have come. With 3000w motors, 80 volt lithium batteries and a whole package of added extras, electric mopeds and vehicles have become one of, if not the most popular choice as we move forward. Carbon emissions are something we now take time to consider, along with helping our planet and it’s for this reason, as well as untold advancements within the electric vehicle sector that so many are now choosing to use them. 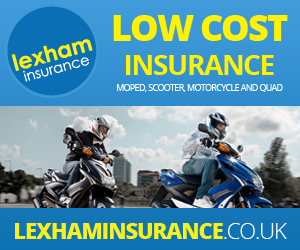 If you’d like more information on some of the electric mopeds available, or perhaps even our electric motorbikes, simply contact us today.